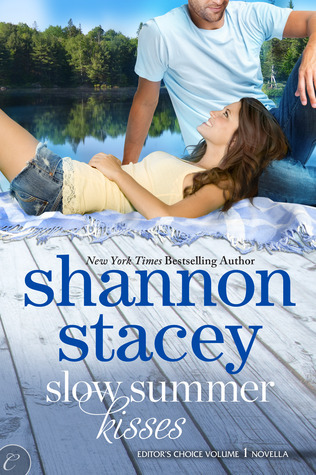 Slow Summer Kisses by Shannon Stacey was a heart-warming romance. While this is a novella, the story felt complete and I enjoyed every minute of it. I quickly became wrapped up in this tale and consumed it in one sitting. The tale begins when we meet Anna Frazier. Up until now she has been a go-getter in the financial industry. One could say she is high-strung and moving in the fast lane. She has recently lost her job, and rather than tap into her savings, she moves into her grandparents, New Hampshire camp home. She discovers her next door neighbor, is her childhood summer friend Cameron Mayfield, and boy has he grown into a fine specimen of a man. The tale that unfolds is sweet, as Cameron tried to avoid the high-maintenance, talkative but oh so beautiful Anna. The characters in this novel are sweet, damaged and captured my heart. I laughed at their antics and became invested in their outcome. Stacey gives us plenty of humorous scenes which I thoroughly enjoyed. While the story line was predictable it delivered exactly what I was looking for. Watching the two of them fall in love was fun. While this wasn’t a full length novel the story-line was fully developed. It does contain sexual content but it was mostly implied. I connected with both characters and Stacey did a good job of making me feel like I knew and understood where they were coming from. Slow Summer Kisses is the perfect summer read. It is light, sweet and perfect for an afternoon escape. I plan to read more from this author. This is currently available as an eBook. FYI..this story and others are available in a collection called Carina Press Presents: Editor's Choice Volume I: Kilts &Kraken\Negotiating Point\Slow Summer Kisses. Had I known..i would have purchased this. This sounds like a really cute summer read, Kimberly. I'm going to be on the look-out for the book! A nice review Kimba :) I think I have this book but haven't had a moment to start on it. I absolutely love Shannon Stacey's Kowalski family series, always fun & entertaining with a wonderful HEA.